I can’t be mad at her for doing this film. She’s so cute, isn’t she? Yanin’s CHOCOLATE successor is no surprise, let alone a revelation. 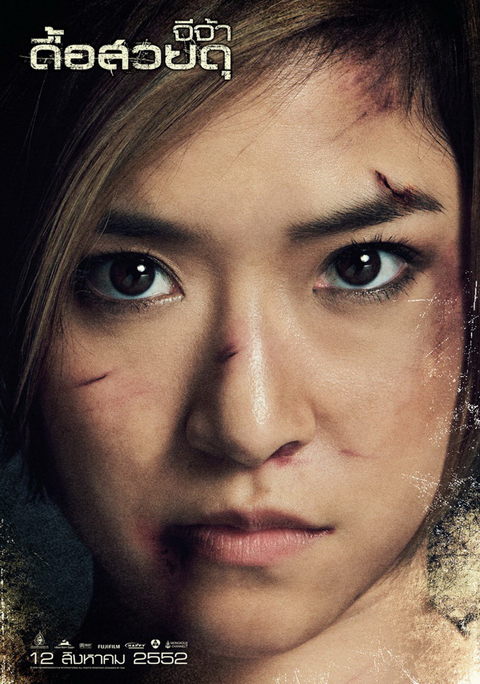 Just as Tony Jaa before her she is gradually turned into a martial arts icon and marketed accordingly. Still she’s like a real person, not (yet) a spoiled actress. But despite her limited acting skills the producers certainly hope that she will be appealing enough to achieve something like Stathamism one day. But so far there’s only one guy who managed to create his own film category. Way to go, girl. The ambitions there obvious: JEEJA DEU SUAY DOO is perhaps the first film that makes the name of the actress part of the title (in Thailand the film was often simply listed as “Jeeja“). 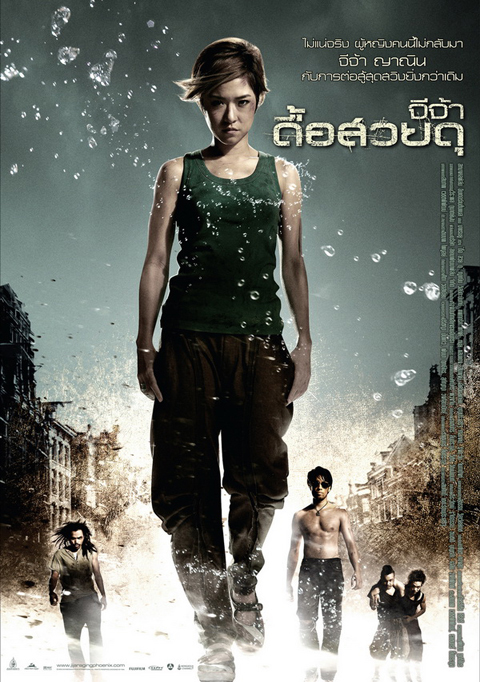 Deu Suay Doo translates roughly as stubborn, beautiful, fierce, which makes the complete title feel like a “Jeeja” sequel. Like she’s her own brand already. Indeed the film would hardly be worth mentioning if it wasn’t for Yanin Vismistananda. The clumsy story about the Jaguar gang that kidnaps girls to turn their pheromones into perfume which is then sold to rich but ultimately sick dudes is certainly not the reason JEEJA DEU SUAY DOO will once again sell like hot cake on the international film markets. The martial arts sequences unfortunately also fall short compared to CHOCOLATE and are shot with a special fan audience in mind. Instead of further increasing the tempo or the level of brutality the team around Rittikrai and Pinkaew opted for a unique fighting style – JEEJA features almost exclusively the good old Drunken Monkey Kung Fu style that’s back in fashion these days. Jeeja is trained by a group of friendly fighters who are totally dedicated to this style. In addition, the filmmakers have added elements from Hip Hop and break dance. The result: the overall tempo is slowed down, everything becomes more playful and comical. 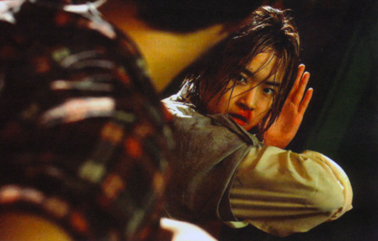 Only the last fight cranks the action button up to 11 – once again this is a no-holds-barred action fest that stands out as one of the finest fight scenes of 2009. Fans should beware and adjust their expectations. But maybe all that is not so wrong after all: films that solely aim for the next superlative will run out of steam sooner or later and will lose their audience just as the audience loses interest. ONG BAK 2 had also introduced new combat modes, but altogether didn’t change its recipe. JEEJA doesn’t seem to look for new extremes – or maybe they knew that Yanin had already reached her limits with CHOCOLATE. Apart from Yanin’s style and new look formally many things stay the same though: it’s fight after fight, an irrelevant story, partly completely idiotic editing, and continuity is nowhere to be seen. Direction clearly means choreography here. The Thai version of JEEJA DEU SUAY DOO is talkative and feels clearly too long. As usual a shorter cut should be enough for the release in most foreign countries. Somewhat more speed would be good, especially since the substance of many dialogues and funny scenes tends to be zero. Despite the flaws the film is charming nevertheless. And like always two or three scenes are filmed beautifully, taking us by surprise, making us wonder why these are exceptions and not the rule (maybe because of 4 DOPs?). The fights are solid, although until the showdown not necessarily spectacular (with the showdown unfortunately shot in the studio against green screen, later pasting a 3D background into the footage shot on different film stock or digitally; an awkward combination, I can tell you). And whoever wonders why they are drinking from multicolored bottles: that’s probably a result of the strict local laws and censorship requirements when it comes to depicting all sorts of “drug consumption“ in movies. JEEJA is very daring nevertheless: alcohol is a highly controversial issue in Buddhist Thailand and the conservatives will certainly slam the film for showing extensive scenes of drinking for the sheer purpose of getting drunk. 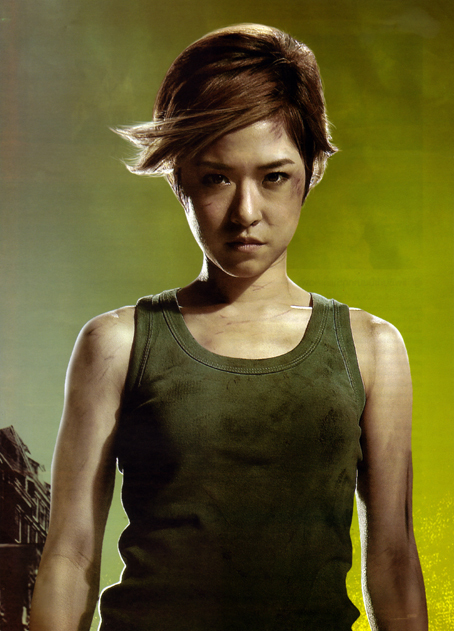 Any which way: Yanin compensates for many of the film’s shortcomings. Just watch the scene when she’s crawling through an ally in slow motion, surrounded by people running away, with a storm whirling newspapers and garbage all over the place. That’s awesome, and we feel like sixteen again. With JEEJA DEU SUAY DOO Yanin confirms her position as possibly the world’s only commercial martial arts film heroine. For fans this one’s must. But otherwise it feels more like a stopover on the journey to something greater. Hopefully that’s true. Hopefully it comes true soon. This entry was posted on 2010/02/22 at 22:21 and is filed under TH YEAR OF PRODUCTION 2009, TITLE J, TITLE R.	You can follow any responses to this entry through the RSS 2.0 feed. You can leave a response, or trackback from your own site.